The Pinboard was devised by Matt & Nick and was distributed to members in issue 93, December 2007 newsletter as the official club hunt for the year. Matt & Nick previously produced A Shut and Open Case - part of the 2001 Sovereign Hunts. The Pinboard takes the form of a single large poster image, depicting a pinboard with over a hundred photos, sketches, notes and other items pinned to it. The authors have not revealed the nature of the prize other than to say that the treasure is buried. The authors will happily confirm any correct location AND soultion sent to them via the club or email address printed on the hunt. A companion article published in the newsletter when the hunt was released (but which contains no clues) can be downloaded here (250KB). Matt & Nick published a first set of 'pointers' in the September 2008 newsletter (download the clues here 1.1MB), and a further two clues on the hunt' second anniversarry, in December 2009 (download here 250KB). Publication of the first clues in September 2008 rapidly led to Paul Harkin cracking part of the hunt and finding a possible location in Stamford, Lincolnshire on 22 September 2008. He sent fellow hunter Martin Dennett to the location in the dead of the night and Martin returned, somewhat bemused, with a ceramic pot marked 'Stamford' containing some interesting items, but without, it seems, the main prize. Matt and Nick confirmed that Paul and Martin had not solved the hunt, but had only 'secured a stake in the main prize' and that club members still have 'a chance of securing their own stake, and helping to find [the main prize]'. Full details were published in the March 2009 issue of the club newsletter and the article can be downloaded here (2.7MB). Members can take part in online discussions and exchange ideas on the hunt in the private discussion forum. Through postings on the club bulletin board the team were able to identify all four designs and arrange them to give a 10km grid reference of ST 96 39  an area that includes parts of the Wiltshire villages of Codford St Peter and Sherrington. 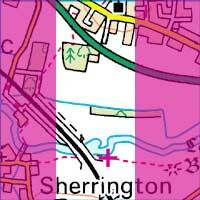 By using the small translucent square flag design (pinned to the picture in the hunt) as a romer on the Landranger map of the area (hinted at in the pink design of the flag), caused the initial 'S' and trailing 'ton' of Sherrington to be obsured - leaving the word 'herring', and a pink cross on a footpath by a river. The marked location was the pictured gate where a casket containing a clay fish was buried. Full details were published in the September 2008 issue of the club newsletter and can be downloaded here (1.2MB).